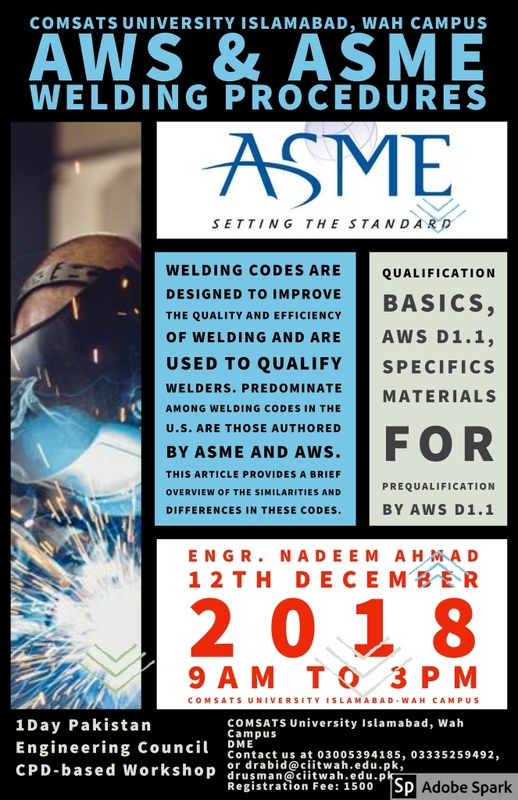 COMSATS University Islamabad, Wah Campus is pleased to organizing a 1-Day workshop on ASME standards of Welding: Welding and Stressed Welded Joints. The resource person is Engr. Nadeem Ahmad, a highly qualified engineer in welding. He has more than 15 years of working experience and countless pieces of training/certifications. Registration fee is Rs 1500 upon arrival, it includes certificate, handouts, tea break, and lunch. We appreciate if you please disseminate the information to your fellows and colleagues for maximum participation.